Alternatives to traditional medicine are proliferating – Bach flowers, aromatherapy, acupuncture – but doubts about their reliability are increasing too. Professor Mulet, a biochemist and author of the acclaimed book Eat Without Fear, debunks alternative medicine and exposes some outright lies. He shows how certain practices are simply a business tactic that damage the health and bank balances of those who make use of them. The author applies his critical eye to branches of alternative medicine such as psychoanalysis, so-called natural medicines and homeopathy, separating the wheat from the chaff and presenting the reader with objective criteria they can use to determine what can be trusted and what can’t. 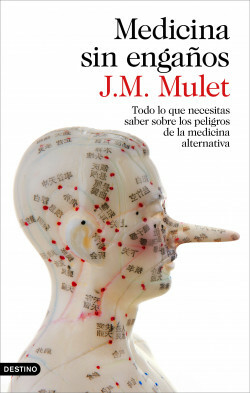 In addition to citing famous cases such as those of Steve Jobs and Jimmy Wales, Mulet applies scientific rigour and direct language to show us that if we have a health problem we should place ourselves in the hands of a good professional and not be misled by false promises. From the author of the publishing success Eat without fear, which sold over 10,000 copies. The book that debunks alternative medicine.